In the past house painting has been a real chore,we are going change that and make your next painting project last longer, go faster and save you money too. 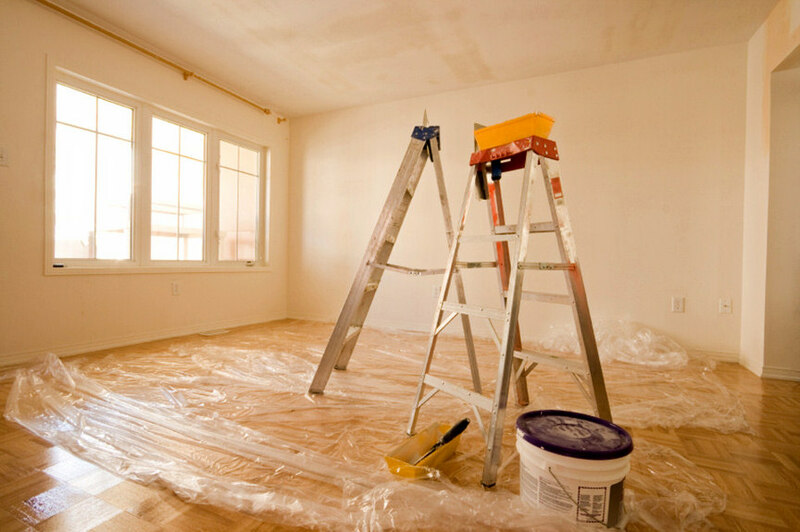 The number 1 reason why most homeowners have painting problems lies right here, selection of materials. There is no such thing as a Good inexpensive can of paint! You get exactly what you pay for. Considering that it costs the Manufacturer appx $4.00 for the can, label, lid, bail and shipping box, now add the cost of raw materials, manufacturing, markup for factory profit, freight, then the retailer has to make his 30- 40% profit, what do you think is in a can of paint that sells for $10-$12.00? Enamels are less likely to be damaged by cleaning than are most flat latex paints. They come in a wide range of finishes including,high gloss,semi-gloss,satin or eggshell which is a hand rubbed look with a very slight sheen finish,not a color. In high traffic areas and where the coating will be washed often such as kitchens, baths, and woodwork, an enamel will be your best choice. Flat wall finishes are more desirable in other parts of the house like bedrooms,living and dining areas. 100% acrylic formulations touch up very well and are very durable. The same rules to selecting quality apply here, avoid the low end materials. Due to the tremendous efforts of paint manufacturing companies having to comply with government regulations pertaining to new anti-pollution laws, we now have fantastic water based paints available for exterior use. Having been trained in the old school of "oil is better", I must now admit they are a thing of the past with a few minor exceptions. Modern chemistry now offers paint formulators a wide range of acrylic, waterbase resins that have the same, and in some cases, superior performance than the oil base paints with the convenience of easy water cleanup, low odor and much more earth friendly. The selection of coatings available for exterior applications is quite extensive and your paint supplier can best advise you on which product is best for a specific application. Ask about the newest introduction to the industry, "Elastomeric" coatings if you are painting any stucco or other cement based areas. Elastomeric coatings look like paint but apply much thicker forming a rubber-like membrane that will expand and contract with the buildings movement eliminating cracks. These formulations are very high in resin, apply very thick (equal to 4-5 coats of regular paint) and reduce repainting frequency, average life cycle is 8-10 years. You will see these coatings advertised as "liquid siding", "lifetime ceramic paint" etc. Figure on paying between $30 - $40 per gallon for a top quality elastomeric paint and don't fall for those "never paint again" complete repaint advertisements. Elastomeric coatings do last longer but nothing "lasts forever", read the fine print in the warranty! Most of the warranties state that "If the product flakes, chips or peels, we will provide you with sufficient material to correct the problem area". Consider This: 1.) These paint jobs cost you 2 - 3 times what the job is worth using top quality paint and a complete three coat paint job which in itself guarantees that it will not "flake chip or peel". 2.) If the product does fails they will give you enough paint to touch up the area only, no labor, just material. 3.) Nationwide, the average homeowner keeps his/her house 5 years only. Why pay all that extra money for a "lifetime warranty"? You are far better off using top quality materials from a reliable supplier and either doing it yourself or hiring a qualified local contractor and supply him with the material you have chosen. In 8-10 years if you still reside in the same home you can repaint it still be ahead of the game. Buying furniture is a long and difficult process for the majority of people, and whilst price still remains the number one consideration for people looking to buy furniture, there are many things that are overlooked. Buying furniture online remains a difficult process, and whilst you have access to much cheaper prices, there are a lot of negatives about buying online. The major problem remains quality issues with products, which often requires you in person to inspect the furniture, the materials used and the build quality. Furniture is an almost entirely aesthetic purchase, and photos have the ability to make bad products look good and sometimes good products to look bad. Where there is a showroom available, always opt to visit it before making a purchase, even if you are purchasing a different colour or model or furniture. Getting a general idea of the quality of the brand, and the build quality of the products, as well as materials used, will assist with making the right decision. There is also the major problem of comfort, when you visit the showroom, make sure you sit on the furniture. What looks good in pictures or catalogue ads may not necessarily be comfortable to sit on. When buying sofas, armchairs and dining chairs, make sure that you can sit on them comfortably enough for them to be a permanent fixture in your home. People often overlook the liveability of unique items of furniture, and instead are caught up by the uniqueness. If the furniture is going to be used for day to day living it really needs to function in that manner. Not many people can afford the luxury of having show-pieces in their home so it is essential that you buy products to suit their intended purposes. Perhaps one of the most overlooked factors in buying furniture is finding out the date it will be delivered and in your home. These days most furniture is manufactured far from the showrooms, and even overseas. Also, a large amount of furniture is made to order, which is fine but has the impact of increasing waiting times for up to several months. For those that are renovating or decorating new homes, make sure that your furniture order coincides with possibly large waiting times. Not often are you able to walk out of a showroom with the exact order you want with the exact specifications, so be prepared to make concessions if you require furniture immediately.